Excess adipose tissue is the characteristics of obesity. 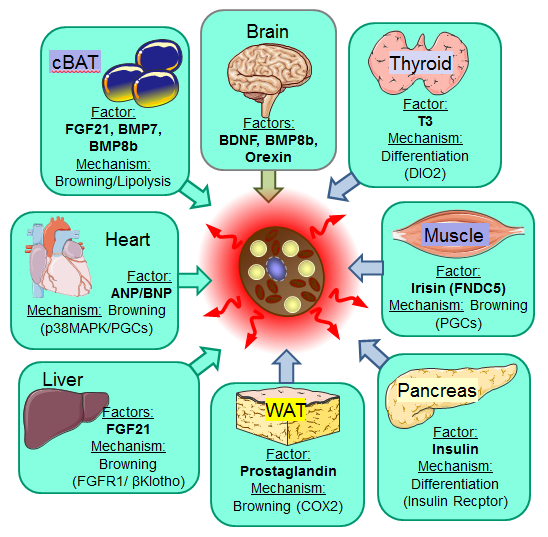 Two functionally different types of adipose tissues are present in mammals: white adipose tissue, which is the primary site of energy storage, and brown adipose tissue, which is specific to thermogenic energy expenditure. Given its specialized function to dissipate chemical energy, brown adipose tissue provides a natural defense against cold and obesity. Several developmental signaling molecules have been shown to impact development of different adipose depots. These include members of the transforming growth factor β (TGF)-β and bone morphogenetic protein (BMPs) family, the fibroblast growth factor (FGF) family, the wingless (Wnt) family, the hedgehog family and others. Combining cellular, molecular and physiological approaches, Dr. Tseng and her colleagues have discovered that BMP7 specifically promotes brown adipocyte differentiation and function. Treatment of mice with BMP7 results in an increase in brown fat mass and reduced weight gain. Current ongoing studies in Dr. Tseng’s lab are to further determine the role of BMPs in the control of brown versus white adipogenesis and whole body energy metabolism using a variety of in vitro and in vivo approaches. In addition to BMPs, Dr. Tseng and her colleagues continue to identify additional factors that differentially regulate the development and function of brown versus white adipose tissue using genomics, proteomics, and small molecule screenings.